Snickerdoodles gone chocolate! These rich, fudgy, crackly snickerdoodles shimmer with sugar. Perfect for the holidays, but totally appropriate for any time of year. Iiiits cookie time! It’s the time of year when so many of us bite off more than we can chew. Literally and figuratively. I mean, there are so many cookies to be made this time of year! In years past, I’ve headed home from the grocery store loaded up with bags of ingredients for no less than eight different types of cookies. And then set out to make all of them inside of one day. Even before I had a kid (and therefore much less leisure time), eight different kinds of cookies were tough to turn out in one day. Let alone one season. This year, instead of handing out cookie plates with a vast variety of cookies in all shapes and sizes, my labor of love for the season is not quite so laborious. I’m planning to give out mason jars filled with just one delicious variety of cookies: Sparkly Chocolate Snickerdoodles. Eight of ’em fit perfectly into a wide-mouthed jar. Screw on a jumbo cupcake liner and tie on some kitchen twine and we’re good to go. 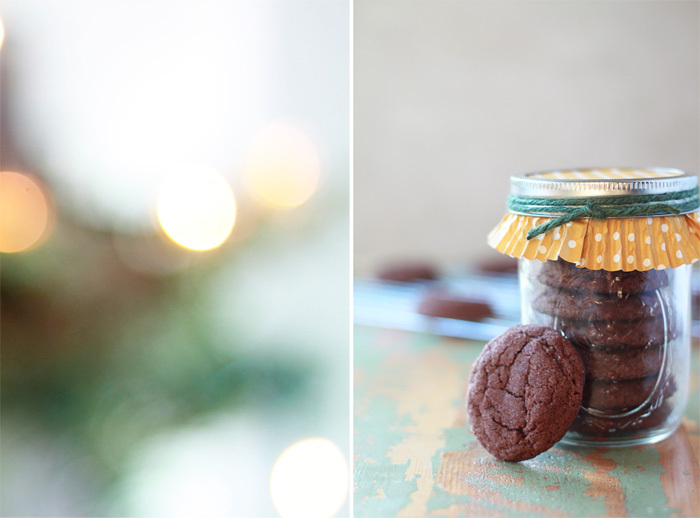 Who wouldn’t want to receive a jar of chocolate snickerdoodles for Christmas? I’m hoping for no one, because I’ve got a busy week full of mason jars and cinnamon and sugar up my sleeve. Not literally, because that would be uncomfortable and sticky. 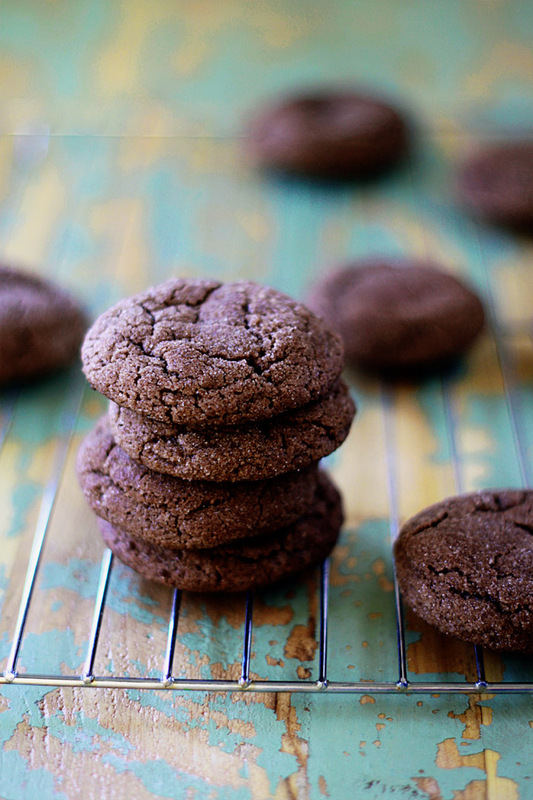 Because these cookies are dark, the sugar in the cinnamon-and-sugar coating shimmers and shines. Hence the “sparkly” in the name. Perfect for the season! Plus, these little suckers are so easy. 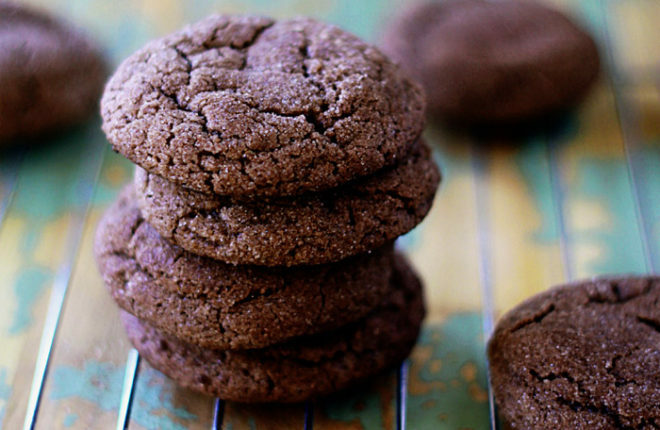 They’re basically a traditional snickerdoodle recipe with some of the flour swapped out for cocoa powder. Not even “basically” – that’s exactly what they are. I kept everything else the same, down to rolling copiously in cinnamon and sugar before baking. 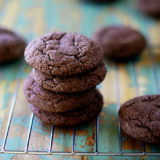 The result is chewy but a little soft, chocolatey but still clearly snickerdoodles. And crinkly and cracked along the top, just like a good snickerdoodle should be. Another bonus with these cookies is that they’re great to make with the little ones. My toddler loves forming the dough balls and rolling them in cinnamon and sugar. But they still turn out perfectly round after baking. Win win! Yup, just one Christmas cookie this year. 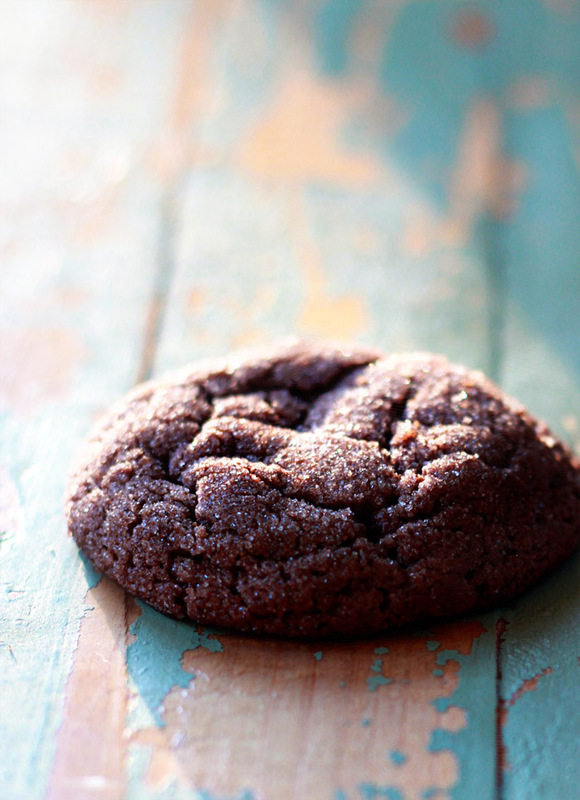 Simplification is a good thing (and so are Sparkly Chocolate Snickerdoodles). In the bowl of a stand mixer affixed with the paddle attachment, or in a large bowl using a hand mixer, beat the the butter and 1 cup sugar on medium speed until light and fluffy, 1-2 minutes. Add the egg and the vanilla; mix well. Place a fine-mesh sieve over the bowl and sift in the flour, cocoa powder, baking soda, and cream of tartar. Beat on low speed just until combined. In a small bowl, stir together 2 tablespoons sugar and cinnamon until combined. Roll dough into approx. 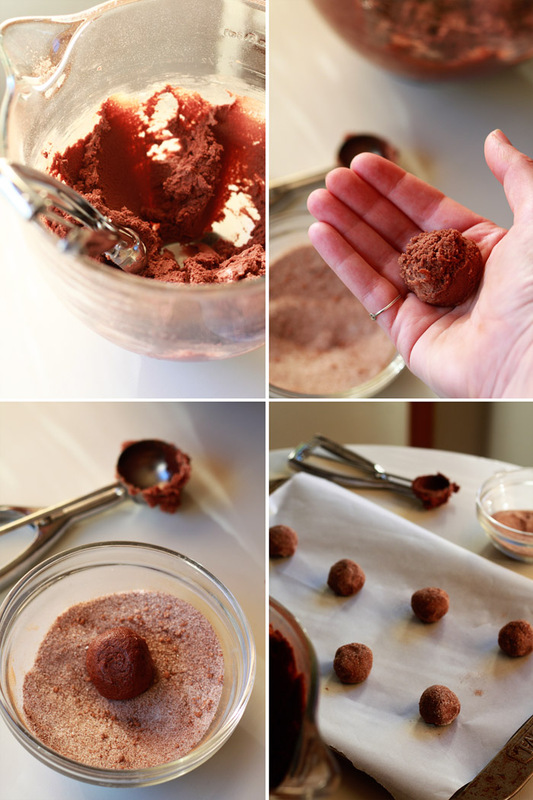 1-inch balls (I use a cookie scoop). Add the balls to the bowl with the cinnamon and sugar and roll until well-covered. Set about 2 inches apart on the baking sheet. Bake until set and lightly browned, about 9 minutes. Remove from oven and let cool on sheet for about 5 minutes, then transfer to a wire rack to cool completely. Cookies keep well at room temperature in an airtight container (3-4 days). They also freeze well. I used salted butter for this recipe - just because that's what I had on hand. You can also use unsalted butter - just add 1/4 teaspoon salt along with the dry ingredients. yum love these sparkling beauties. Such a fun take on a classic! Sparkle + chocolate + cinnamon – wins in my house every time! 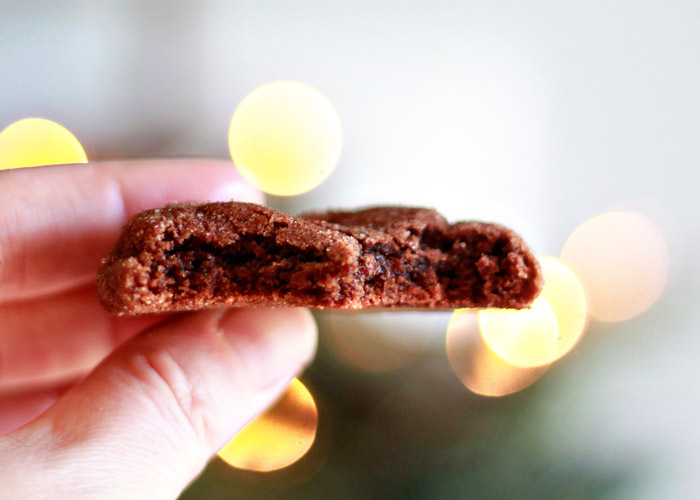 I love these for a Christmas cookie treat! I am making nuts and cookies for our families this year and these have moved to the top of the list for candidates. No rolling, cutting and decorating – I like that. And no-one can say no to chocolate! Yes – they are so easy! Thank you for reminding me – I wanted to whip up a batch of spiced nuts for the holidays, too, and totally forgot! Too much going on. 😉 Merry Christmas to you! I love this idea for the holidays. And the mason jar idea is so cute! 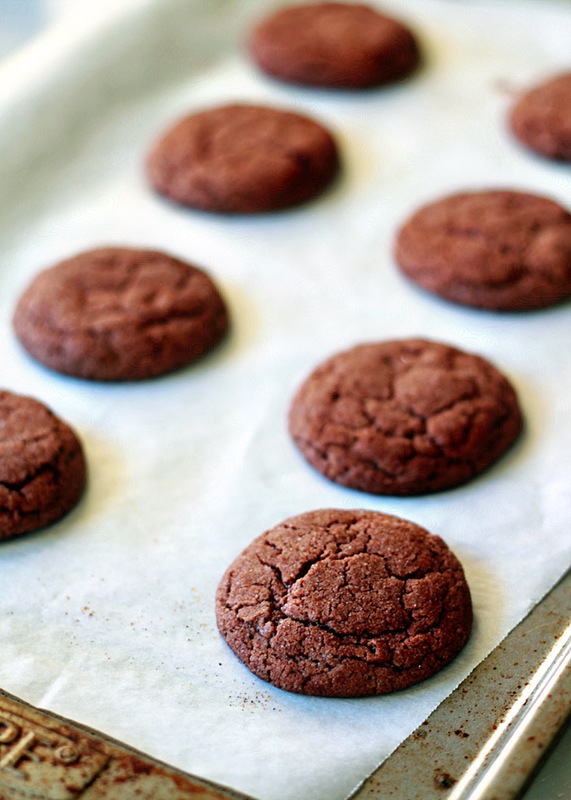 These are gorgeous – perfect for cookie baking next week! I admit it, I sometimes fine snickerdoodles to be a little…bland. But not these— they’re sparkly AND chocolate —love them! What a wonderful recipe! So easy and quick. They are a bit too sweet even for my taste (and I LOVE sugar and sweet stuff, but even I have limits). They make great chocolate chip cookies too – just reduce sugar by 1/4 cup and increase cocoa by 1/4 cup to keep powder ingredients balanced; then instead of rolling them in sugar + cinnamon, i rolled them in 1 cup of mini-chocolate chips – they still turned out to be very sweet, but they’re the best chocolate chips I’ve ever had (no smell of molasses). Terrific recipe and they are delicious. Thank you. Yay, so glad everyone liked the recipe. Thanks Janet! This dough was easy to work with. My cookies look perfect and taste amazing. Thanks for the recipe! Yay! So glad you liked them. Thanks so much for your review!